Finding the true Utopia has been a constant dream for me. So I plan to go to Shangri-La this coming September. Now I want to officially announce my Painting in China 2016 trip. I would like to take a group of ambitious artists to go to the Southwest part of China (Yunnan Province) to see and paint this exotic and mystical place. If you are interested in this trip, Please visit: http://www.qh-art.com/china-2015.html. It will be a wonderful experience of your and my life time. My third demo: painting flowers. I have got more and more abstract nowadays, some time even chaotic. This painting is reflecting the current status of my mind. This year is rather difficult year for me. Quite many friends has asked me. "You teach so many workshops. Do you feel tired? Have you felt burnt out?" Well, what can I say? As a matter of fact, I have been burnt out a long time ago. On this difficult journey, I don't have much choice except keeping on going, and going. Experience the hard time makes the art more meaningful. This is the second demo at LAAFA. Apples are my favorite still life objects. This painting is predominately warm. So the green apple stands out more and becomes the center of focus. "Demo at LAAFA 2016 1"
LAAFA (Los Angeles Academy of Figurative Art) is a wonderful school provides rigorous training of the academic way of drawing, painting, and sculpting. I am really honored to teach still life painting workshops here. It is my second time coming to LAAFA. I want to thank all the wonderful artists for attending my class. This is my first demonstration. I did this plein air painting this morning. The spring in Texas is spectacular and the colors are so fresh. I enjoyed the perfect weather today. It is one the ideal days to paint outside. The weather is wonderful, but the climate is so strange. The spring comes so early this year. The temperature has gone beyond 90 F this afternoon. We might have a super hot summer this year. I am continuing on the research of the monochromatic paintings. I started to consider to remove the transparent oxide red off my palette. This painting was done with burnt umber, white and a little black. It looks the experiment works. This way will save me significantly on the expenses on paints. I have a major computer crash over the weekend. I have lost quite a bit of information. If you used to receive my daily painting emails, but found you did not receive this post and posts in the future, please let me know, I have to manually put you back. I am sorry for the inconvenience. "Plein Air at Xidi Village (Day 2)"
I have started another large painting. When I was at Xidi last September, I saw so many artists plein air painting all over the place. I really want to do several serious paintings to reflect the lives in this small place. You have seen I painted quite a few doorways there, but that was just the necessary foundation work. This one I start to involve more figures, which are the artists in the village. I know it is a challenge for me to paint any serious painting with my fragmented time, but I will give a try. I used this ref photo the second time. Xidi village is the place that keeps coming back in my dreams. This morning I painted this Xidi doorway again. I want to practice this technique more to gain more control and gradually develop a style. There is a Chinese character on the red sign posted about the door, I have waiting the paint to dry to write it on. Mark Boedges is the artist I started to follow very recently. I met him at the Scottsdale Artists' School last month and saw his paintings at the Legacy Gallery. I like the way Mark composes his color designs. Pure landscape painting is not my cup of tea, but I want to study and practice more to get better. So I decided to copy a few Mark's paintings to understand more how he handle his colors. This is the first one I have done. This morning I joined a group of local artists, painted plein air at the French legation Museum at the downtown Austin. My color scheme for this painting is rather weird. I did not plan to do this but it turned out like this by itself. I don't quite like this color scheme. Can any psychologist explain what is going on? "Keep Austin Weird" is the motto of this city. I must be possessed by a "weird" spirit this morning. "Big Apple and Small Onion"
I have been back to Austin for a few days now, and this is what I did today. Somehow every time I am back home, it is always difficult to start painting right away. So many other things because priorities, and painting have to give in. Several days passes quickly and my mind is blank at this moment, so I used this simple painting to warm up. The flower demo was on the last day of the workshop. I saw a bouquet of white roses casually set in an empty can. I move it to my still life station. It is almost perfect as my subject. However, from my greediness, I tried to "arrange" it to make it "better". Well it ends into a disaster. Finally I have to pull all the flowers out of the can and redo it. It happens too often, that the mother nature presents the best design for us, but our ego will come to say: I can do better. Well the result is often the opposite. So the ability to "discover" is more important than the ability to "create". At 1:00 PM EST on Thursday March 3, I will be interviewed by Leslie Saeta and Dottie Leatherwood of the Blog Talk Radio "Artists Helping Artists". 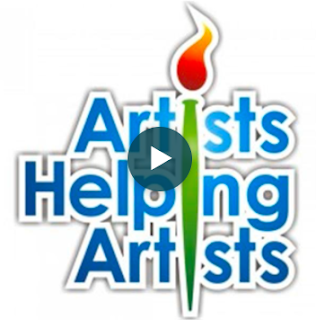 If you have some time on Thursday afternoon, please join us by clicking the link of "Artists Helping Artists". I will share my story and experience in art with you.